This recipe reminds me of being little. 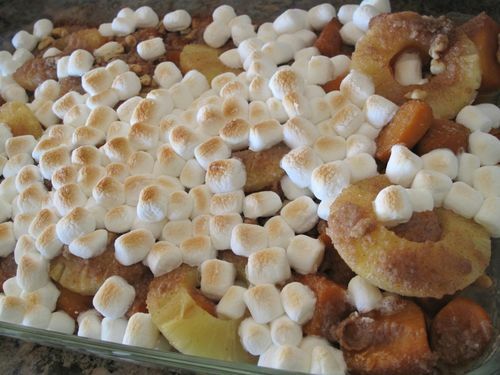 Every Thanksgiving my family would make this and I remember when it was finished baking it would be time for the oven to be set to "broil" and topped with marshmallows. My sister Susie made these marvelously Tacky cupcakes adorned with Gummy Worms. Bake cupcakes as directed on package. Cool and frost. If you haven't had a Tacky Party.......I highly recommended it!! I found the beer picks at Bake it Pretty. Unroll crescent triangles and place hot dog on long edge of dough. Roll up like a jelly roll. Place on baking stone and back as directed on crescent package. My sister Cathy made the funniest Tacky Foods for our party. Ants on a log and an apple display of colored marshmallows and olives. Cut celery into nice even sticks. Spread with cheese and top with mini chocoalte chips. An instant ant party! How tacky is that?